MiniCoater | LSP Industries, Inc. 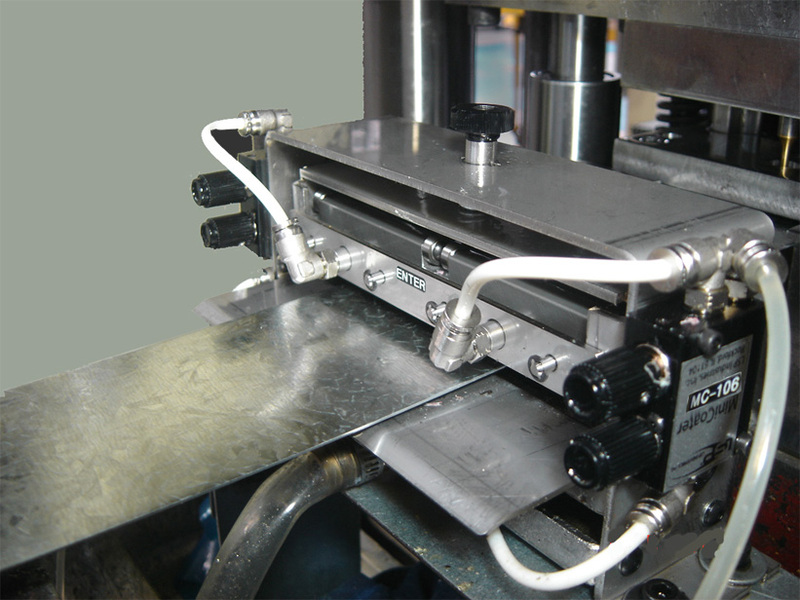 The MiniCoater is a line of smaller sized roller coaters designed to dispense the correct amount of lubricant onto coil stock before it goes into the press area. Small but sturdy, these roller coaters are made of stainless steel and built to last a lifetime. Manifolds can be shut off if a particular strip of the coil stock does not need lubrication, thus saving on lubricant cost. All of the features of the MiniCoater were designed for delivering the most controlled lubrication to the surface of coil stock while still giving the operator ease of operation and maintenance of the system. A pressurized reservoir supplies lubricant to the MiniCoater. 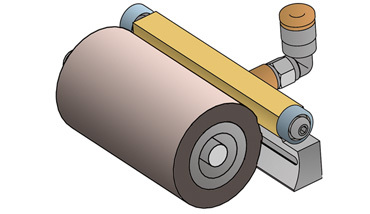 A mechanical clamp on the top of the MiniCoater is used to open the rolls. Coil stock is threaded through the rolls and the clamp is disengaged causing the rolls to close on the coil stock. A Solenoid located under the Reservoir is set to open and close at a programmed count. Every time the solenoid opens lubricant is allowed to be deposited on to the rolls. The volume of lubricant dispensed is determined by how often and/or how long the Solenoid Valve is kept open. Needle valves are used to give selective volume control to either top or bottom rolls. 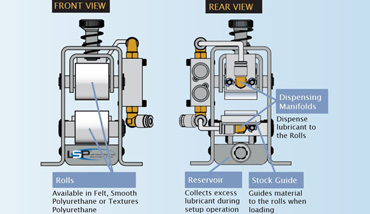 The volume of lubricant dispensed is determined by how often and/or how long the Solenoid Valve is kept open. Two needle valves are used to give selective volume control to either top and/or bottom rolls. Dispenser Manifolds are concave to fit the curvature of the roll. The Manifold rides against the rolls supported by a set of bearings to eliminate any drag. A hinged support gives it a floating action over the rolls. A pressurized reservoir supplies lubricant to the MiniCoater. 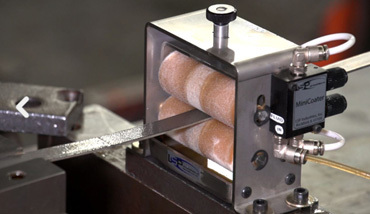 A mechanical clamp on the top of the MiniCoater is used to open the rolls. 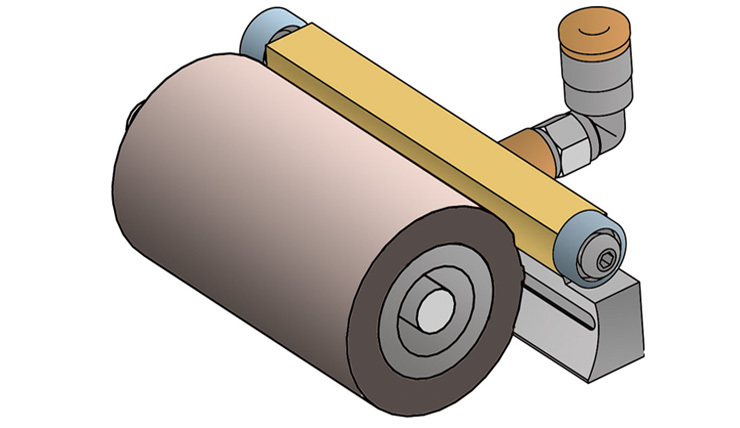 Coil stock is placed through the rolls and the clamp is then engaged, causing the rolls to close on the coil stock.